I have been concentrating on schooling and a retreat with my quilting friends in between. I have been learning more and more about "Word" program. I am so glad I have the opportunity to learn what I will need to get a better job. My typing is getting much better. I started at 20 wpm and in 3 weeks I am now at 25 wpm. I just need to stop looking at the keyboard every now and then. I made 5 little Christmas Tree Dottees that went to Finland. My Girlfriend Suzanna made a basket of Sock monkeys. 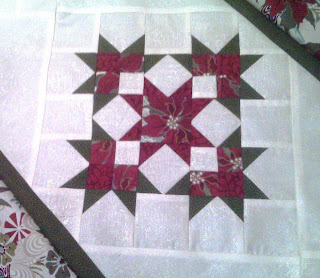 Lorle shared with us her table runner. We love the block pattern. Time to go back and concentrate on getting my life in control.